A polling place in Kansas City, Missouri. A Republican-backed push to change the ways private-sector unions collect dues failed Tuesday, and Missouri's midterm U.S. Senate election is set to pit Attorney General Josh Hawley, a Republican, against incumbent Democratic Sen. Claire McCaskill. 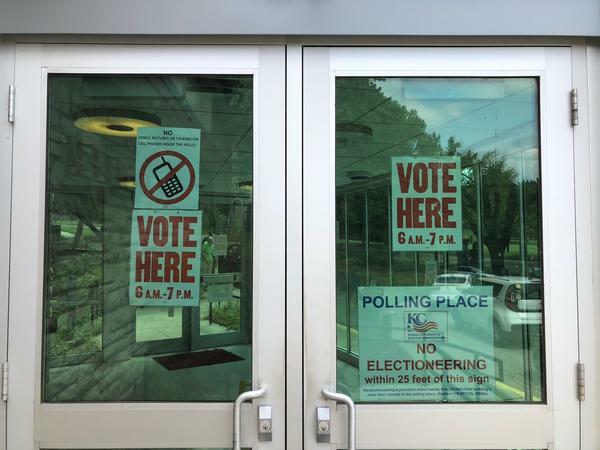 Tuesday's primary also had Missouri staring down a possible major change for private-sector unions in the primary election, will line up November’s contest for state auditor and a key Missouri Senate seat in northwest Missouri. In the Kansas City area, voters weighed in on their pick for Democratic candidate for Jackson County executive as well whether to start a rental inspection program in the metro. 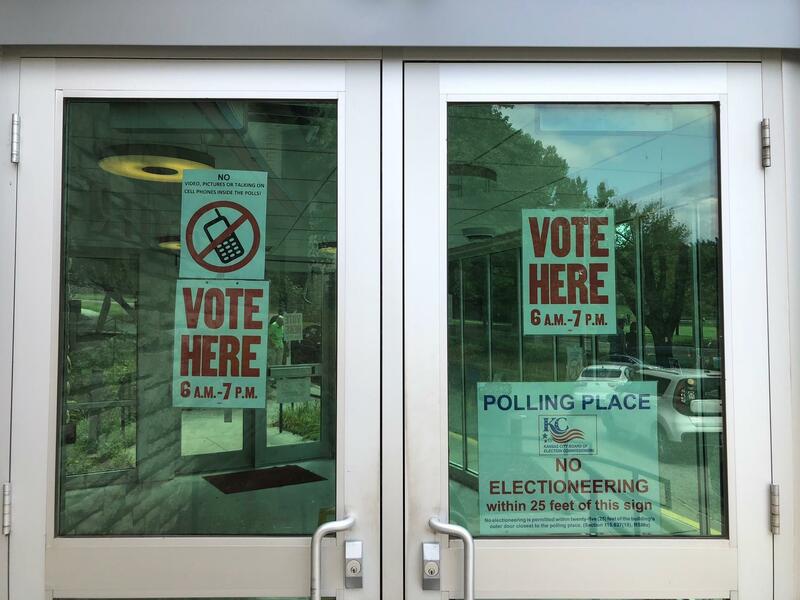 These major races drew out voters in larger-than-usual numbers for a primary: County election boards estimated turnout was about 30 percent. This post will be updated with a breakdown of the races and ballot measures as their fates become clear. Missouri won’t become a right-to-work state. Voters chose to overturn a law passed last year that would ban unions from requiring workers to pay dues. Republicans delivered a right-to-work bill to former Gov. Eric Greitens quickly after he took office in 2017. He signed it but the issue was forced to a statewide vote by unions, keeping the law from taking effect almost a year ago until the vote on Proposition A.
It’s a victory for unions, which represent 8.7 percent of Missouri workers. Lots of union money, both in and out of state, flowed into the race. The main group who opposed Proposition A, We Are Missouri, gathered at the Pipefitters Local 533 Hall in south Kansas City on Tuesday night. Kelly Street of the Brotherhood of Railway Carmen said unity on the issue was key. “This is a union and non-union issue. This affects all the workers in the state of Missouri,” Street said. And national AFL-CIO Secretary and Treasurer Liz Shuler said that the people who worked against Proposition A gave what they could. “Every answer to every question was yes, everything we asked for … we’re so grateful,” she said. Last week, Gov. Mike Parson said in Kansas City that he didn’t expect the vote to be the final say on the measure, but didn’t give specifics. Republican legislators are likely to attempt to pass another bill. Union backers argued that such a law would have lowered wages and weakened unions. Supporters of right to work, which is law in more than 25 states, had said it would make Missouri more business-friendly. The Associated Press called the Hawley race at 8:30 p.m. He was the handpicked GOP candidate, with the backing of President Donald Trump, Gov. Mike Parson, U.S. Sen. Roy Blunt and dozens of state GOP lawmakers. Hawley beat out 10 other candidates, including former libertarian Austin Petersen and military veteran Tony Monetti. Hawley received the most votes of any Republican in Missouri — even Trump — in the 2016 election when he won the attorney general’s office. The race between McCaskill, who won her primary handily, and Hawley is expected to draw millions of dollars in outside money and play a role in whether Democrats flip the Senate. Both McCaskill and Hawley said in statements that they want to debate each other ahead of the Nov. 6 election. McCaskill proposed four town-hall style debates, saying, Missourians deserve the same chance to ask you questions and hear your answers as they have consistently had with me." Hawley wants "a series of one-on-one debates ... no moderator, no complicated rules. Just me and Claire McCaskill debating on the back of a flatbed truck, traveling all over the state to air out our differences." Marie Jackson was at a watch party in Lee's Summint on Tuesday and said she threw her support behind Hawley after seeing him in Blue Springs over the weekend due to his anti-abortion stance. "He had all the checkmarks I wanted in a candidate," she said. Lee's Summit resident Debbie Havens voted for Courtland Sykes due to the way Hawley went after Greitens, but said she'll vote for Hawley in November. "I will have to vote for him because I can't vote for Claire," she said, adding, "I don't think he stands for anything"
The weekend before Tuesday's election, Hawley told KCUR that he was looking forward to "earning everybody's vote" for the November election and "uniting together as a party to beat" McCaskill.